Under Panel rectifies air flow entering vehicle under engine room. 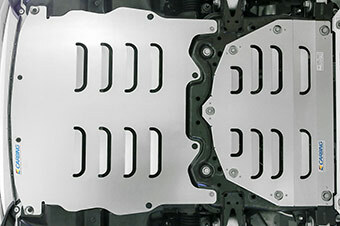 By adding flat panel under the engine room, under panel eliminates air pile up that occurs at mid to high speed driving. Rectifying air flow under the car adds down force to the vehicle. 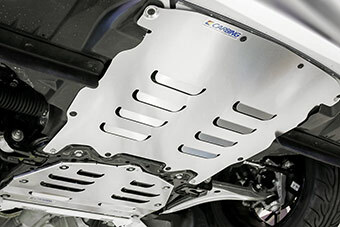 Under Panel also increases air flow speed under the car that pulls the air from the engine room for better cooling efficiency. Thus it stabilizes water and oil temperature. ※Lower Arm bar installed vehicle compatible.